The Civil War Monument in Glendale Cemetery is deteriorating. The Glendale Cemetery Tours are helping to raise funds for its repair. CARDINGTON — The second annual Cardington Glendale Cemetery Tour will be held Sunday, Oct. 15. The walk will be made from 2 to 4 p.m. and guests will be hosted as they visit the graves of six Cardington citizens whose lives were notable and who contributed their abilities and talents to the betterment of the community and nation. Recognized this year will be Rex Jenkins, portrayed by Pat Drouhard; Adah Fricke, by her great granddaughter Christina Yoho; J. S. Peck, by John Wallis; Lillian James, by Emily Levings; Sandy Sanderson, by Don Burdsall; and Ward Conaway by his son, Phillip Conaway. Sonny Grooms and Andrew Schoppelrei will give the history of the Civil War Monument. Visitors to the tour are asked to enter the back gate (Glendale Avenue) of the cemetery where registration can be done. Tickets for the tour are $5 with proceeds going to the restoration of the Civil War Monument. The goal of the restoration is $35,000 and at this time a total o $2,000 has been raised for the project. Donuts and cider will be served to those attending, free of charge by Lisa Brake, Howard Hanna Realtor. The tour is sponsored by Friends of Cardington. 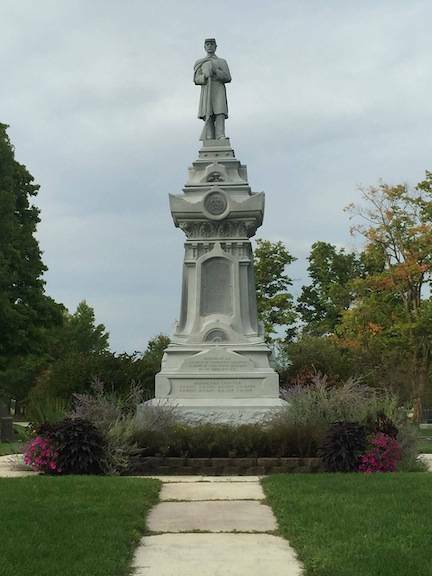 https://www.morrowcountysentinel.com/wp-content/uploads/sites/29/2017/10/web1_Cardington-27s-Glendale-Cemetery-Monument.jpgThe Civil War Monument in Glendale Cemetery is deteriorating. The Glendale Cemetery Tours are helping to raise funds for its repair.